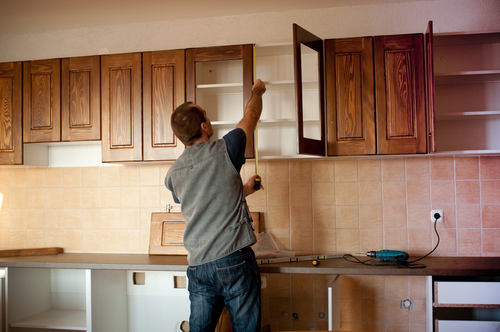 Is remodeling your kitchen on a budget even possible? 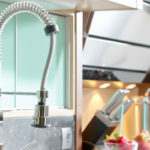 Projecting a kitchen remodel in its entirety can be daunting, perhaps you have concerns about being able to afford everything you want—and what happens if you get part way through only to uncover you can’t afford to finish the project? With careful and realistic planning it is possible to remodel your kitchen on a budget. Follow these tips and tricks to get the kitchen of your dreams at a price you can actually afford. When you write out the expenses for everything you plan to have done, don’t max out your budget. Things rarely go 100% according to plan, and so you want to include 20% extra wiggle room in your budget for unexpected bills that might arise. Cabinets are a big part of your overall kitchen appearance and they are also an expensive part of any remodel. By purchasing your cabinets wholesale you can save a lot of money, securing a higher quality cabinet for less. The higher quality a cabinet is, the longer its life expectancy, saving you even more money in the long run. Wholesale cabinets are far more affordable than retail cabinets, they do not have the additional mark up a third party retailer charges. At Tops Kitchen Cabinet we offer wholesale cabinets to both businesses and private parties. This is supposed to be about saving money and hiring a professional will cost more up front, but their expertise will likely save you from some big bills and huge headaches later on. Without proper knowledge a remodel can hit a brick wall—literally, and you don’t want to get halfway through your project only to realize the original plan was a bad idea. A professional designer has seen many remodels and they know what works and what does not, plus they know which short cuts save money, and which cost more down the line. In order to save a great deal in costs, imitation materials are sometimes better than their expensive role models. 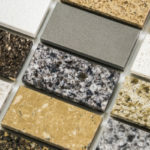 For instance, costly granite can be replaced with metallic laminates for an affordable cooper-toned countertop. Other kitchen remodelers have gone as far as to install concrete for countertops, it might sound odd but this trendy industrial look is showing up in many high end homes. Plus, nothing is going to mess up durable concrete countertops, meaning they will last for a really long time. Be open to the variety of alternatives to standard materials; the savings might afford you a kitchen grander than your wildest dreams. Cost Cutting Cabinet Ideas! If you cut corners to save money now you might end up paying for it double time down the road. You’re likely more focused on the numbers in your bank account today, but don’t forget to look at your kitchen remodel as a future investment too. Make sure that you don’t spend less now, only to spend more in the future. 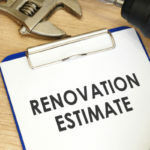 If you need to extend your budget to ensure your remodel is correctly completed and can stand the test of time you should do so, your future self thanks you. If there is anyway around it, you don’t want to relocate the kitchen sink. As soon as plumbing gets involved costs really start to soar. Brainstorm, research, and bring in a second opinion to see if there are cheaper alternatives to making your sink placement more productive before having it ripped out and relocated. 21 More Ways to Save! Paint is inexpensive and easy to change, as opposed to other facets of your kitchen remodel, although it can be incredibly helpful. Experts recommend using one main color that is not gutsy or trendy for 60% of your kitchen, including the cabinets. Then, they advise using 2 other paint colors, 30% of one and 10% of another throughout your kitchen. You can use more fun or trendy colors on a backsplash wall, if you decide you don’t like that shade anymore it won’t be a big deal to change. On the other hand, changing the color of your kitchen cabinets, that’s a different story, capable of taking down your budget. Paint color can make a small space look larger without knocking down any walls. Painting cabinets or kitchen walls white can really open up a small space without costing much money at all. 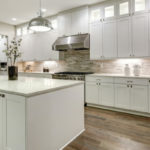 Recognizing the power the little and less expensive details can have on a remodel will help you spend wisely, getting the most out of your kitchen remodel budget, no matter how big or small it might be. 20 Big Tips for Small Budgets!